Deborah Masuoka draws her inspiration from animals, both domesticated and wild and their social order in nature. 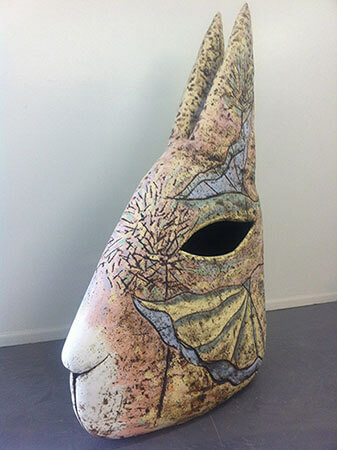 The rabbit head is a metaphor for how society deems certain individuals/animals as prey and others as predators. By enlarging the scale of the animals’ heads, Masuoka reverses the social order by turning the prey into the predator, thus empowering the underclass. At first glance, Masuoka’s work appears to cast a demur and gentle aura, but once explored, her work speaks to the power and complexity of life and to a society that imposes superiority upon the marginalized. Her work literally and metaphorically imprints the human touch into each sculpture creating a personal connection in a digital world. Originally from Detroit, Michigan, she earned her Bachelor of Fine Arts degree from Wayne State University in Detroit, Michigan and a Master of Arts degree from Cranbrook Academy of Art in Bloomfield Hills, MI, where she studied with Jun Kaneko. Her work has been exhibited nationally and is included in numerous private and public collections. The exhibition closes April 27, 2013.